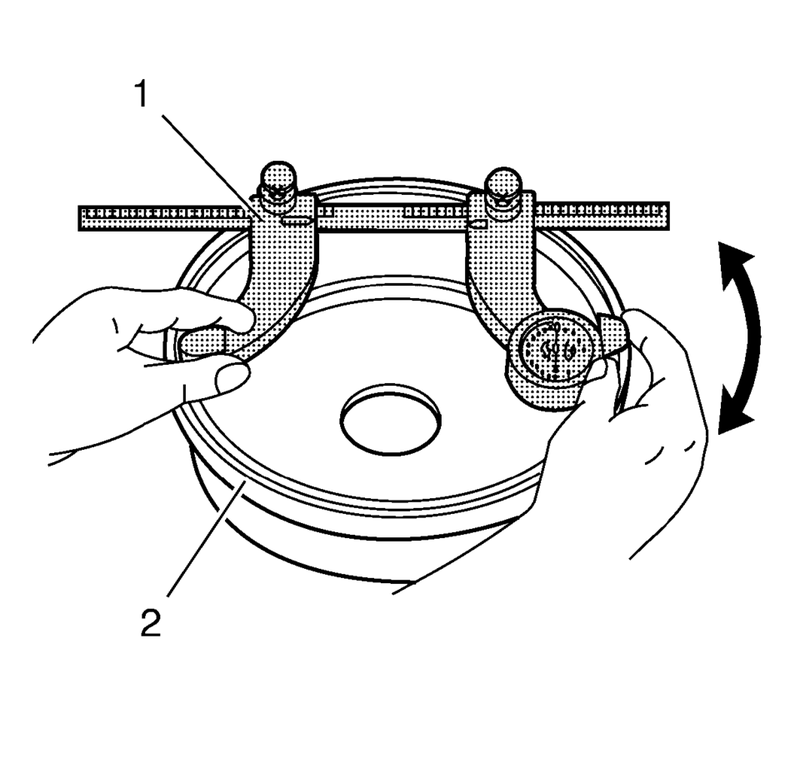 Clean the brake shoe lining contact surface of the brake drum (2) with denatured alcohol or an equivalent approved brake cleaner. Using a brake drum micrometer (1) calibrated in thousandths-of-an-inch, measure and record the largest diameter of the brake drum at four or more points, equally spaced around the drum. Ensure the measurements are only taken within the brake shoe lining contact area. The micrometer must be positioned the same distance from the outside edge of the drum for each measurement. Compare the largest diameter measurement recorded to the brake drum component specifications. Refer to Drum Brake Component Specifications. If the largest diameter measurement of the brake drum is less than the maximum allowable inside diameter after refinishing specification; the drum may be refinished, depending upon surface and wear conditions. If the largest diameter measurement of the brake drum is equal to or greater than the maximum allowable diameter after refinishing specification; the drum may not be refinished. If the largest diameter measurement of the brake drum is equal to or greater than the discard diameter specification; the drum requires replacement. Install brake drum. Refer to Brake Drum Replacement.